Summary: When Richard Mayhew stops one day to help a girl he finds bleeding on a London pavement, his life is forever altered, for he finds himself propelled into an alternative reality that exists in a subterranean labyrinth of sewer canals and abandoned subway stations. 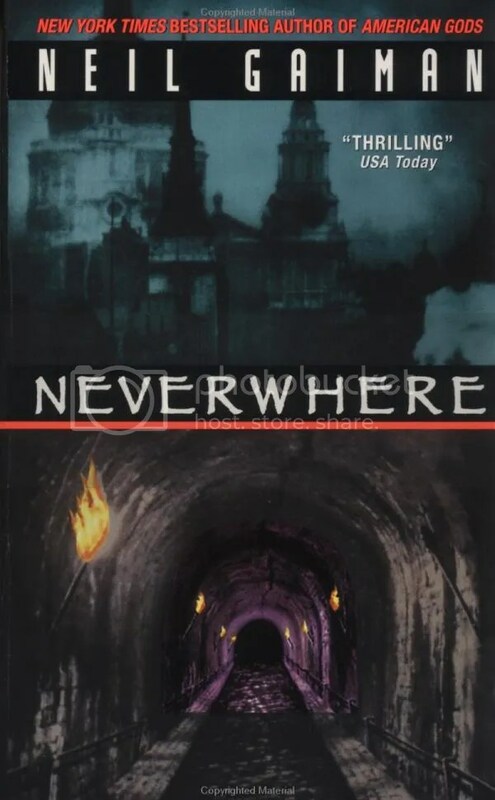 He has fallen through the cracks of reality and has landed somewhere different, somewhere that is Neverwhere. Slight rant before beginning: that is a ridiculously short summary. The Time Machine had a longer summary than that and the book is half the size of Neverwhere. Hmph. This is one of my favourite books. Thank you, that is my review. I’m just kidding! Okay so this book is weird. Basically, there is a whole hidden world under our world and each station of London’s Underground is something different. How cool is that? As for the story, you have to go in knowing that it is going to be weird. Think world of Alice in Wonderland or Hitchhiker’s Guide to the Galaxy and with about the same level of randomness. Question nothing and all will be well, though the world building is very impressive; it almost seems plausible if magic was a real thing and all. Anyway, the world and the eccentric characters fascinated me and the story kept me hooked. Oh a word of caution: Stay away from the graphic novel and the miniseries. Like I said, this is one of my favourite books. Neil Gaiman is godly and the sooner you accept that, the sooner you will find true happiness. This entry was posted in Personal, Reviews and tagged Book Blog, Contemporary, Dreaming With Ink, Horror, Michelle’s Paper Garden, Neil Gaiman, Neverwhere, review, urban fantasy by dreamingwithink. Bookmark the permalink.